I was sharing with a group of friends recently on how we help each other because we all “get” each other. We have some of the same experiences and we all have the same basic hopes and fears. I began to think about how helping others helps me in the long run. Then, I had a different thought: How long does it take me before I realize that I am the one in need of help? I was sitting there with these friends and at some point, in the conversation I drifted off into my own little world. 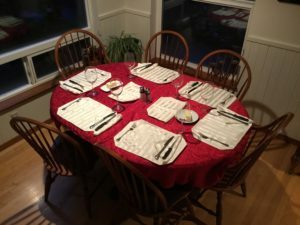 I was transported back to the time when my family sat me down at our dining room table and calmly but sternly told me that now was the time to do something about my problem. They had come together in an alliance to intervene in my behavior. I remember thinking at the time that they had all turned against me and I began to plot my revenge. However, I knew that there was something off about me. A slight edge to my being. Inwardly I breathed a sigh of relief because this allegiance showed that I was not the only one thinking this way. I knew that the hot flashes, nighttime sweats and nightmares were not normal. I knew what those symptoms could be but I had gone thorough that before. It seemed impossible that I would go through that again, yet there I was. My family was not concerned about the recent oven that had been following me around. They were more concerned with the way I interacted with them. The way I had become a dictator. A sharp-tongued witch, not sure when I would fly off the handle. The family thought it was time that I did something about my problem before they all moved out. I eventually found a nurse practitioner that understood the problem. I was given a weekly patch to wear that seemed to control the symptoms. Now years later I sat in that room with my friends thinking about this event. When it was my turn to speak, relating back to the topic of how do we know when we need help, I recounted my story about the hormone patch. There have been times when I have felt myself turning green. If you are over 50 you might remember the good doctor Bruce Banner. He would get angry or hurt and began to bust out of his clothes as he bulked up and became The Incredible Hulk. An uncontrollable marvel that was prone to all types of calamity. This is what it feels like when I’m due for a patch change. It starts slow and builds up. Next thing you know I am green. I also feel this way when I’m in need of help from my friends. My behavior is off, I get dictatorial and am prone to reigning control over all I come in contact with. I have very little patience for strangers in traffic and little old ladies in the grocery store. If color was an indication we would all turn green at some point. We all need a little help from our friends and relations. When I find out what turns me green, I can act on it. Then and only then, can I be of help to others. We help each other, but only if our own house is in order.